The five kids return from a mission and get out of the scanners. 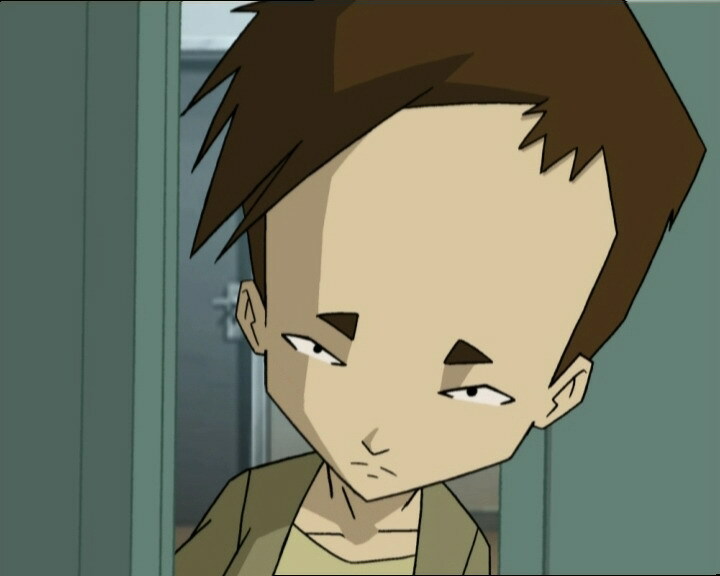 But an error occurs in the program and Yumi finds herself in Odd’s body, while the boy is in the Japanese girl’s body. Jeremy checks and finds a bug in the rematerialisation program. He can’t repair it just like that; the two kids need to live with their condition until the brainiac finds a cure… However, the numerous disadvantages and complaints start when Odd gets an itchy back from Yumi’s bra. The two teens’ case worsens that night, when parts of their bodies begin to disappear, then reappear… More and more frequently and for longer each time. 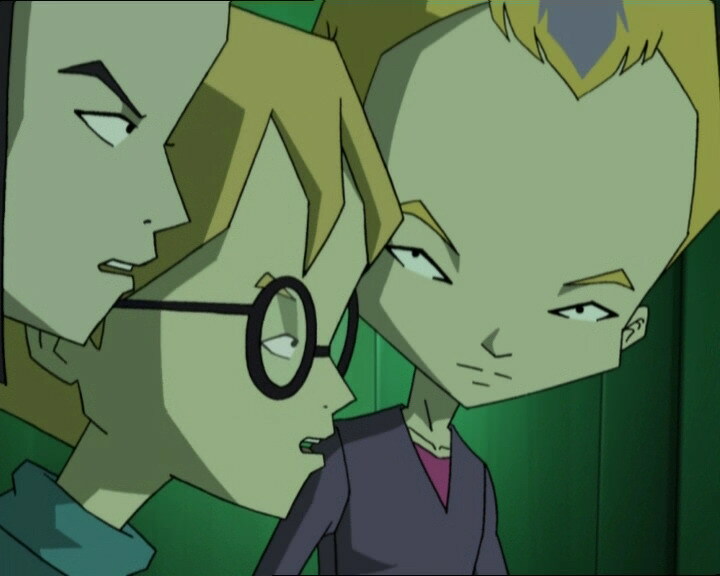 The team finally goes to Lyoko and Aelita goes into a tower. Meanwhile, XANA sends monsters, worrying the group, and Ulrich needs to face them alone, because Odd and Yumi don’t know how to fight in their respective bodies or use their weapons. Inhibitors are blocking access to the program Jeremy needs, and the momentary disappearances of the catboy and the geisha are increasing in frequency and duration! 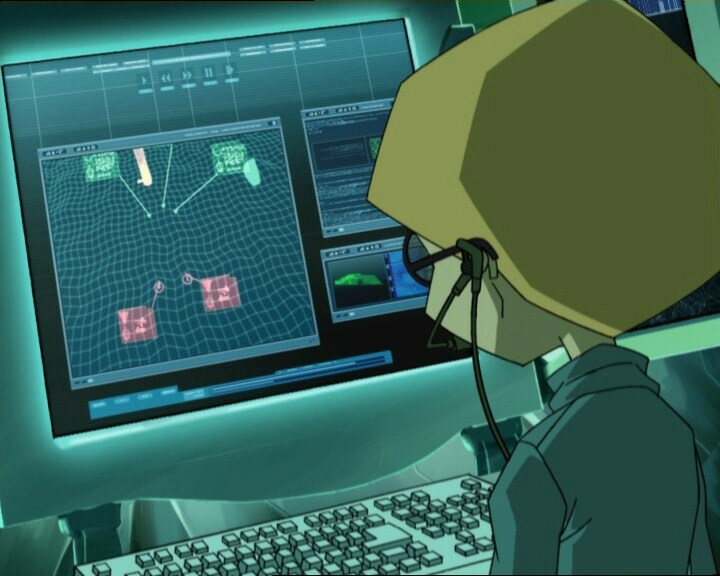 Jeremy is curt: the lives of his two friends are in danger, they need to go to Sector 5 to disable the inhibitors… Before taking the Transporter, Ulrich is devirtualised by a Megatank, while the other virtual kids leave for Sector 5. 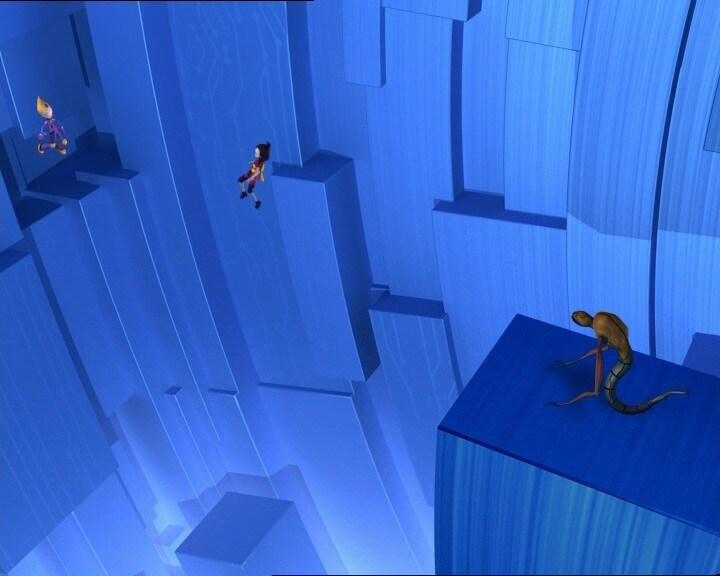 The two remaining fighters seek the seemingly-inaccessible key on the other side of an empty void. In reality, it’s no big deal, as the heroes can float across because the gravity in the room has been modified. Fighting Creepers and reaching the key still remains difficult: Odd and Yumi are forced to combine their efforts in order to survive. 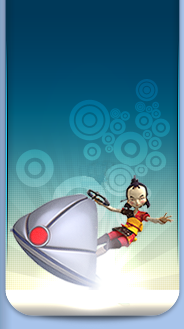 - Attack: None; On Lyoko, try to stop our heroes from reaching the interface, so Odd and Yumi’s bodies will disappear. - Yumi owns colourful and interesting clothes that Odd wore while in her body. - Ulrich plays heads or tails, and according to him, the smell of Odd’s feet is worse than his laser arrows. - In this episode, we learn that Odd uses his laser arrows by visualising he’s shooting them, then concentrating. This contradicts the prequel episode “XANA Awakens Part 1” in which he fires his first arrow by accident. - First and only time Odd rides the Overwing, and first time Yumi rides the Overboard (technically). - During Ms Meyer’s class, the students often change place. - The factory microphone disappears from Jeremy’s ear at the start of the episode. - The colours of Odd’s pants are inversed when he gets ready to pick up his cup. - The manhole cover in the park isn’t rusty when Yumi (in Odd’s body) takes it off. 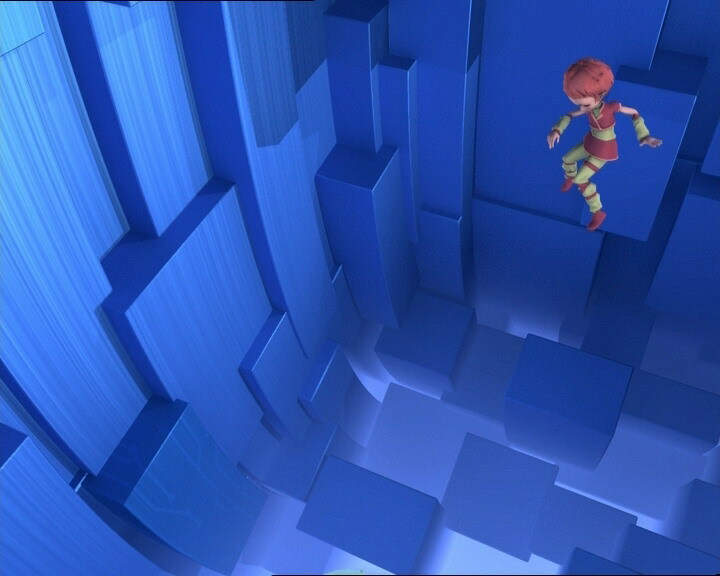 - The halo of the tower Aelita goes into is red in one shot when XANA didn’t launch an attack in this episode. 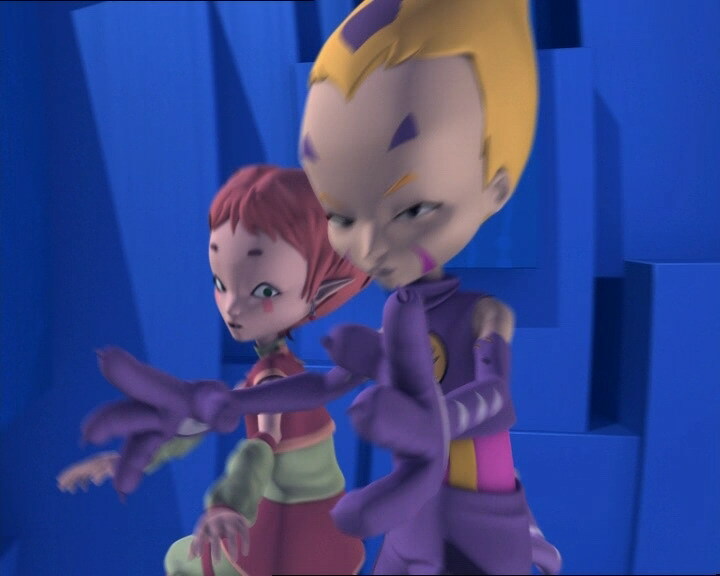 - The top part of Aelita’s shoes is red instead of white when she walks under the arches with Yumi (in Odd’s body), Ulrich and Jeremy. 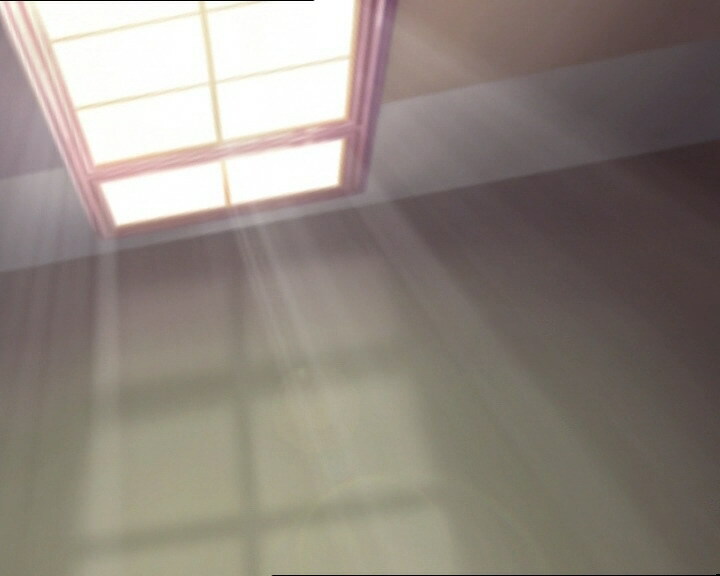 - The handle to Odd and Ulrich’s door is on the right instead of the left when Yumi (in Odd’s body) is in the corridor, and the door is brown instead of grey, like the other doors in the hallway. - Odd (in Yumi’s body) can’t eat with chopsticks, but he had no trouble with it in episode 38, “Temptation”. - In this episode, Ulrich and Odd swap beds and sleep with their heads where their feet would normally be. Odd’s stuff is also in the drawer under Ulrich’s bed. - Aelita’s dress merges into her sweater when she sleeps in the lab, the whole thing being the one colour and missing some lines. It’s also drawn incorrectly when she asks what happened between Odd and Ulrich, the top part of her sweater being the same colour as her dress. - Only bug in the materialisation program (the only one without XANA’s interference, of course). - First episode in which a Creeper isn’t destroyed by one only one shot. - First appearance of Megatanks in the Ice Sector. - First time we see the Transporter trip from the Ice Sector. 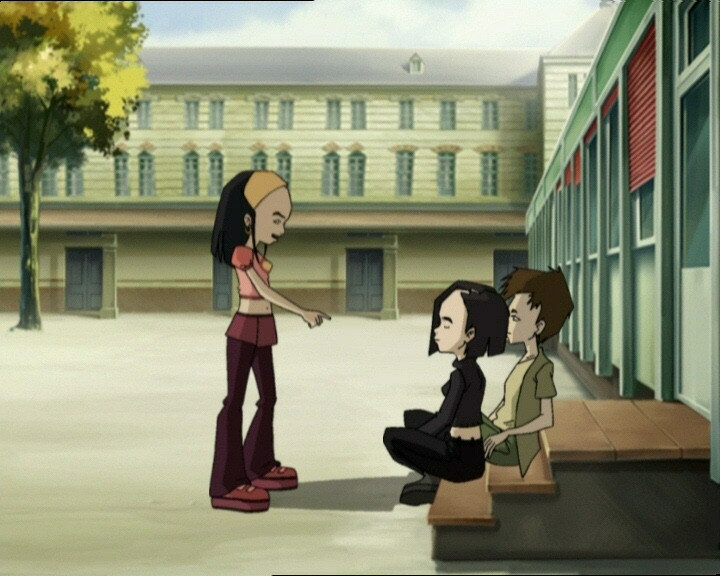 - In the original script, Odd did something much worse for Yumi and Ulrich’s reputation while on the steps outside the cafeteria: he didn’t hug Ulrich while in Yumi’s body – he kissed him! We’re not certain as to why the scene was changed, but we can guess. Guacamole is a sort of avocado and onion soup, lemon-scented with a bit of cream. Coming from Odd, such a reference should be expected! This is an allusion to the famous play by Shakespeare: “Romeo and Juliet,” written from 1594 to 1595. The two characters have remained universally known for their tragic love story. Catwoman is a character from the Batman series! The woman is a vigilante fighting in a cat suit! A split personality can be a symptom of schizophrenia, a severe personality disorder. - Yumi’s family eats sushi when Odd joins them for dinner in Yumi’s body. Sushi is a Japanese dish. Outside of Japan it’s one of the more emblematic dishes of Japanese cusine. Ulrich: Ok! Heads, it’s Odd first…and tails, it’s Yumi! Heads, heh, Odd! …Huh, Yumi, I lose. Ulrich: Hey Yumi, are you ok? Yumi (in Odd’s body): What am I doing over here, huh? 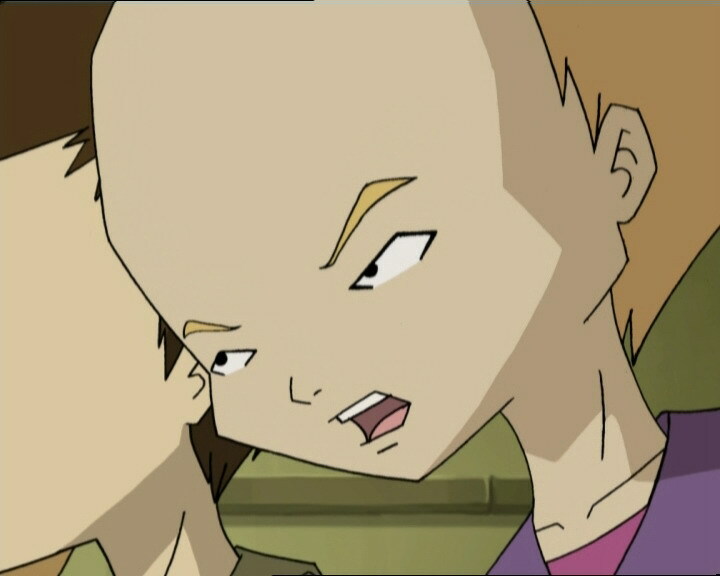 Odd (in Yumi’s body): Uh…I uh…I think we’ve got a little problem here! Jeremy: I guess there’s a little bug in the rematerialisation program! Yumi (in Odd’s body): You call this a little bug?! Jeremy: Gotta fix the program. Odd (in Yumi’s body): How long will it take you? A couple of hours at the most? Jeremy: Um…if I work through the night, it might be ready tomorrow morning. Yumi (in Odd’s body): What?! You mean I’m going to have to sleep in a guy’s body?! Jeremy: Well I’m not going to get any sleep at all, I’ll have you know! Yumi (in Odd’s body): Don’t you dare take it off, do you hear?! Note: I think we get the gist of what’s going on now, so until otherwise stated, “Yumi:” refers to Yumi when she is in Odd’s body and “Odd:” refers to Odd when he is in Yumi’s body. Yumi: Ok, so, what’s my schedule for this evening? Odd: Well try the three Bs: Bacon, Bath, Bedtime! Yumi: Can you eat with chopsticks? Odd: Yeah, as long as they look like forks! Yumi: Don’t do anything stupid with my body either! Odd: Mine’s still under warranty! Yumi: I think you’d better brush your teeth and go to bed early tonight! Ulrich: Isn’t tonight the night you’re supposed to break up with Magali? Odd: Yeah, that’s right…and with Claire too! Ulrich: You’re going steady with two girls at the same time? I didn’t know that! Odd: Hey! I’ve got a great idea! You’re always too shy to ask Yumi out, right? Now you can practise on me! Ulrich: Odd, that’s not a great idea, it’s a stupid idea, and anyway I’m not that crazy about Yumi! Sissi: My dear Ulrich! When will you understand that I am the girl for you? What do you see in this string bean anyway? Odd: Hey! Now I see why Sissi’s so crazy about you! Ulrich: Do that one more time and you’re dead! Odd: Well! You try to do a friend a favour, and that’s the thanks you get! Magali: I know all about Claire! You are so…despicable! Claire: Odd? I know all about Magali, you sneaky rat! Sissi: You can tell Ulrich he’ll have to beg for a date with a real flower his string bean veggie drops him! Yumi: Sissi just told me to tell you something, something about veggies? I didn’t get it… What’s going on? Milly: Ulrich! Do you mind answering a few questions for our Academy gossip column? Ulrich: Yes, I do mind! Yumi: What has gotten into them now? Ulrich: Ask that imbecile Odd! Mr Ishiyama: Why is she speaking to us in…in Chinese now? Yumi: Watch what? Oh! Ohhhh! Ohh, gross! Ulrich: I warned you! Heheh, it’s more powerful than a laser arrow! Ms Ishiyama: Yumi, are you up? Could you give me a hand with breakfast? Yumi (to Odd): You are so lucky that you are in my body right now or I would beat you to a pulp! Milly: Yumi Ishiayama, haha! Transformed by love! Cool headline, huh? Odd (looking at the quiz): Oh, man! Tough break…Yumi’s gonna kill me! William: Do you always have conversations with yourself? Odd: Well yes…they call it a split personality, but nothing to worry about! Yumi: Huh? There was a math quiz this morning? Did you manage? Odd: Well if you mean sharpening my pencils and all that, yeah! Jeremy: Transfer Odd! No, I mean that is uh…Yumi. Ah, no, wait! Uuuuum…oh, whatever. Transfer, scanner, virtualisation! 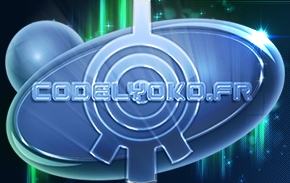 Yumi (in Odd’s body on Lyoko): And now let’s hear it for Catwoman…! Yumi: XANA’s a pretty lame architect, he forgot to put the stairs in! Yumi: Great, anyone know how to fly? Odd (to Yumi): Great shot! You missed a Creeper 10 yards in a hallway?! Yumi: Odd, what are you doing? Odd: Can’t you see? I’m swimming through guacamole! Ulrich: Odd! Is that…is that you? Odd (back in his own body): Of course! What’s the matter with you, don’t you recognise your own friends? Note: Everyone’s now back in their rightful bodies. Ulrich: Speaking of, uh…did you tell her what happened between us? Odd: No way! I plan on staying alive, good buddy! 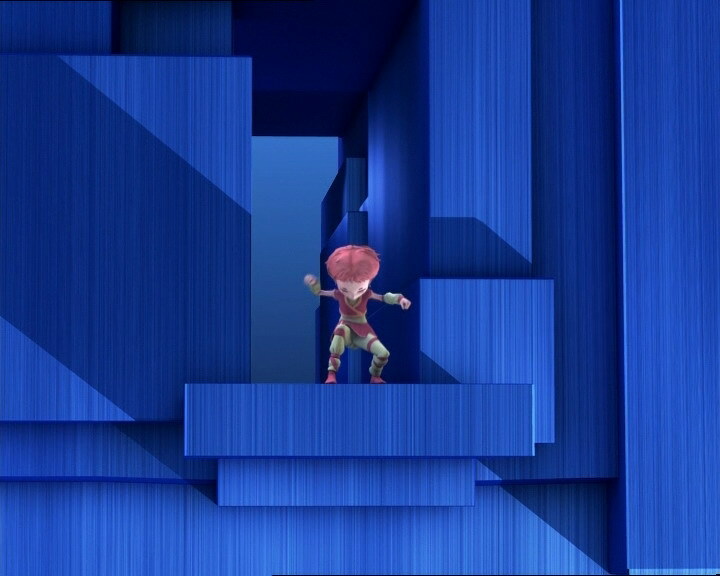 Aelita: Why? What did happen between you? Jeremy: Hey, speaking of Yumi, look, she’s over there with the school paper! Odd: I don’t like this…! Ulrich: I warned you, sorry I can’t give you any pointers, good buddy!